The present report provides a whole market picture that is a research result with the most possible deep detailed information. In order to give our customers the better understanding of analyzed country, this research provides an overview of the state of Russia (regional location, area, population, religion, natural resources, industry, etc. ), as well as affect the general trends of Russian agrarian sector. This intellectual product includes information as refer total crop area being sown in 2013, as well as the harvest of major crops, expressed in tonnes and percentage. The report gives the comparative characteristic evidently displayed in tables and diagrams of whole agrochemicals consumption in 2013 in comparison with 2012. 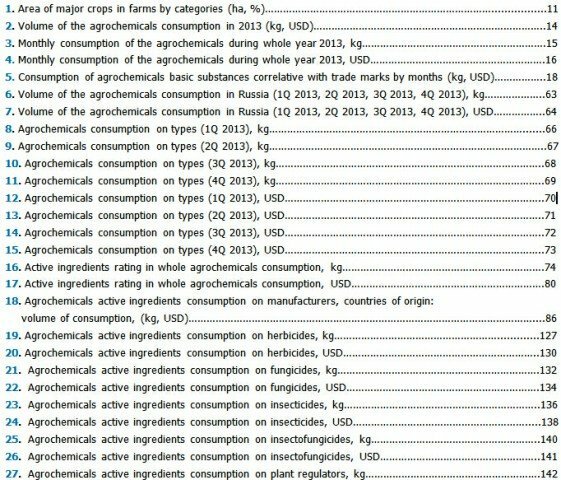 The annual statistics of the agrochemical market are traced in details on months and quarters of 2013, the particular consumption of agrochemicals basic substances correlative with trade marks by months is showed. The information is given about whole agrochemicals consumption within complete year including consumption on types, the rating of used active ingredients in whole volume of agrochemicals consumption including percentage of basic substance and formulation type, the active ingredients consumption in the context of types has been analyzed, the agrochemicals consumption in weight and worth on manufacturers and countries of origin, the interaction chains between manufacturers and consumers on active ingredients and suppliers have been traced, the manufacturers market shares on countries of origin have been analyzed, the consumers and suppliers market shares in whole volume of agrochemicals consumption have been presented, the detailed information about agrochemicals, which have been purchased by importers during analyzed period including their types, trade marks, active ingredients, package types have been given, the basic substance prices due to stock exchange fluctuation in cut of active ingredients maximum, medium, minimum prices have been counted. The Consumer’s and Supplier’s directory with appropriate companies contact details like telephone, fax, e-mail, web-site have completed the report. The data are resulted for the whole year of 2013. The primer target of this research is to help the professionals of the strategic groups and management team with taking a proper decisions while entering to the Russian agrochemicals market and maximize the benefit while negotiate with business partners. 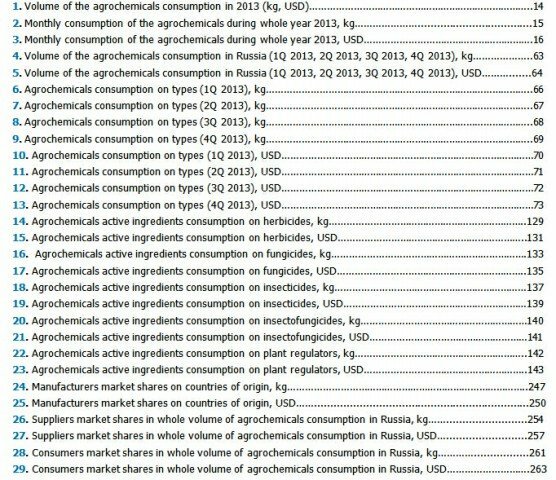 It gives a detailed analysis of the Russian pesticide industry and speaks comprehensively about 2013 year scenario of the important market tendencies.